Getting serious bugs in your mobile app, guys. For iphone, anyway. Doubt it's on my end, as have dumped and reinstalled app twice. I can view one, maybe two threads before getting this message. Once I get that, might as well not access the forums for a day or two. Sign out, sign back in, same message. Get it randomly, too. Once it pops up, app completely ceases to work. I'll get it on sign-in, too, press ok or send, and just sit there watching the wheel spin. Reeeeeeaaally infuriating. Also tells me I've duplicate posted. Have to cancel and backtrack, refresh page to see my post. That's been going on for months. We all talk like its the best toyota forum out there, and it's great, but even the mobile version( not app) is janky and pics don't line up, ads all overlapping posts, etc. Really? Really? Last edited by combatcarl; 11-28-2013 at 12:19 AM. Or I just get this for a thread to read, sometimes with a spinning wheel, sometimes not. Like its a lottery, "oooo, is it gonna work? Oop, guess not." Or log in and see the intro shot, then nothing....forever. this is on an iPhone? looks like it. anyway I will forward to the tech guys at IB (site owners) and see if they have a fix. Something may have gotten fubarred in the back ground making another tweek..
edit: do you get this if you are on your phone but not using the app? Last edited by dropzone; 11-28-2013 at 03:15 AM. Yeah. iPhone. Mobile site runs okish. App is really buggy. There are times the mobile site doesn't run well, but that could be service related. Didn't mean to sound so cranky. But a junkie with no fix can get that way. After a 4th un/reinstall, with about a day of leaving it uninstalled, (about as long as I could handle withdrawal) it seems to be working. Still get an "Error, the request timed out", but otherwise, doin ok. And don't get it all the time. OK..personally I use the full site on my phone...the only annoying thing about using it is the 'we have a mobile option' pop up. Ok... Was just updating ya. The full site for whatever reason, constantly resizes on my phone. Pictures 2-3x screen width, maybe it's an iPhone thing? Like I said. Mobile runs ok-ish. And app is running alright for time being. I don't care to chew through data all that much, so the simplest, most streamlined, lowest data consumption option is what I prefer. Last edited by Toyota~Boy; 11-30-2013 at 05:02 AM. you didnt specify your browser, however Chrome has the option to by-pass mobile sites compleatly & its wonderful. Dolphin does as well. 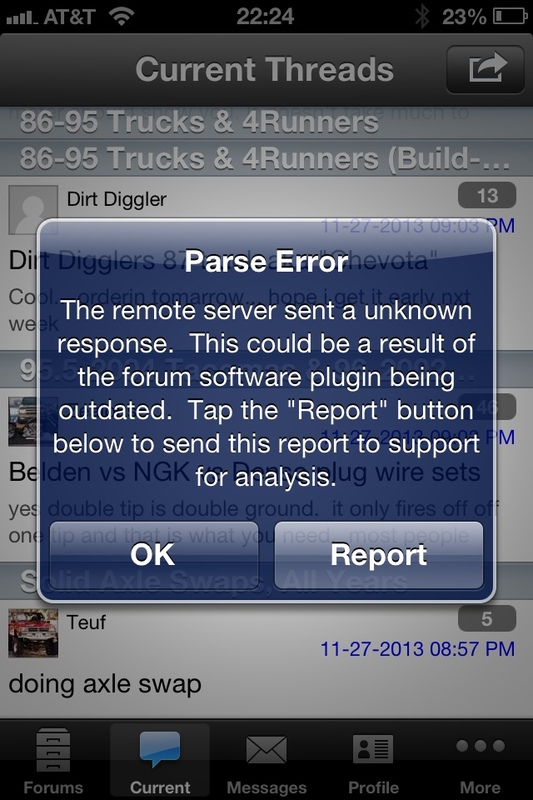 I've been getting the Parse Error on multiple threads using the YotaTech mobile app on my iPhone the past couple of days. I've deleted the app and reinstalled, however, the Parse Error keeps occurring. Is anyone else getting error this now? Last edited by rworegon; 04-08-2015 at 04:09 PM. 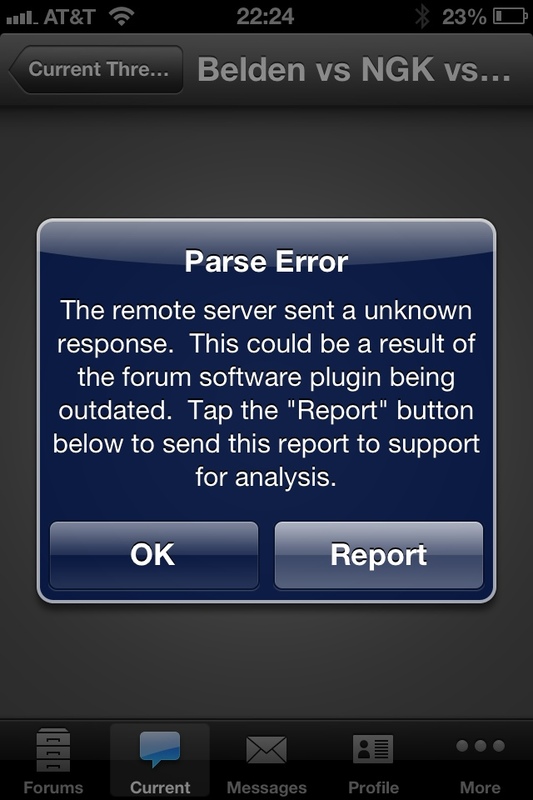 I've been getting the Parse Error on multiple threads using the YotaTech mobile app on my iPhone the past couple of days. I've deleted the app and reinstalled, however, the Parse Error keeps occurring. Is anyone else getting error this now? This happens to me every so often. Sometimes deleting and reinstalling the app works sometimes it doesn't. Probably a side note: I'm almost always on the app on my iPhone and I noticed the other day while I was on the full site some of my posts had extra words and letters in them, I'm guessing it's the punctuation I use? Just thought it was odd. Parse error has been a problem lately. After the first or second page, I can't continue reading. And subscribed posts no longer refresh. I don't think the app is a huge priority, not really talkin trash here, but the site probably has bigger issues. Would be nice, though, since I'm almost always on the iPhone for forums. Meh. Whatever. Seems to happen to the threads I'm interested in. Bummer. X2. But this thread works for me. Now the app only works on my iPad and not my iPhone. sorry you guys are having issues with the app. It's not just the iPhones my Samsung note 2 has been doing it for weeks now.